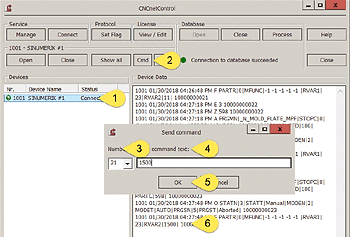 This highly configurable CNCnetPDM device driver for Siemens Sinumerik 840D controllers with OPC classic enables you to monitor and output machine-, process- and quality data from machines with these controllers. It also allows you to change or write parameters and variables on these devices. An additional local account for user ‘auduser’ which is member of the ‘Administrators’ group with the same password used by user ‘auduser’ at the controller has to be setup on your PC. Download the Sinumerik OPC classic device driver, extract all content of sinumerikda_dll.zip into the folder where you have CNCnetPDM installed. CNCnetPDM automatically copies the original sinumerikda.dll and appends the machine number as configured in the INI file, e.g. sinumerikda_1001.dll for machine 1001. In addition an INI file with the same name is automatically created by the device driver, e.g. sinumerikda_1001.ini for your first machine. Enter the password for user auduser twice and click button [Ok], the dialog closes. Do not start the service. As user ‘auduser’ does NOT have the right to ‘Log on as a service’ one additional step is needed. Open a command prompt with elevated privileges and type in secpol.msc. Navigate to Security Settings -> Local Policies -> User Right Assignment. Open ‘Log on as a service’ and add user ‘auduser’. Now you should be able to start the background service without any issues. Section [GENERAL] contains information about global parameters used by the driver on startup, please only change the number from Alive command = 0 to another number if your controller does NOT reply to command ‘/Bag/State/opMode’. Use our test program to check if you can read this OPC item. Commands defines the number of OPC commands you’d like to execute, maximum value = 30. With an unmodified INI file for a controller CNCnetPDM queries two ‘R variables’, section  = ‘R variable 1’, section  = ‘R variable 2’. To change the value of these 2 variables CNCnetPDM has to be running and you should see data for RVAR1 and RVAR2 via CNCnetControl, section ‘F’. If the machine shows a red icon, state disconnected and you get just output E = 0 the machine is not reachable at all. This has nothing to do with the device driver, the controller is switched off, it’s a network issue, DNS Hostname or IP Address is wrong. If the machine shows a green icon, state connected but you just get output E = 1 the machine is reachable but the controller does not respond to commands, check your controller setup and the parameters used in section [RS232] of CNCnetPDM.ini.Please use the tool CNCnetPDM.OpcDA.SimpleClient.exe to check if the machine replies to commands. Delete all sinumerikda_NNNN.dll and ClientAPI_NNNN.dll (NNNN = machine number) files. If you already have created adapted INI files for specific devices do NOT delete the sinumerikda_NNNN.ini files.